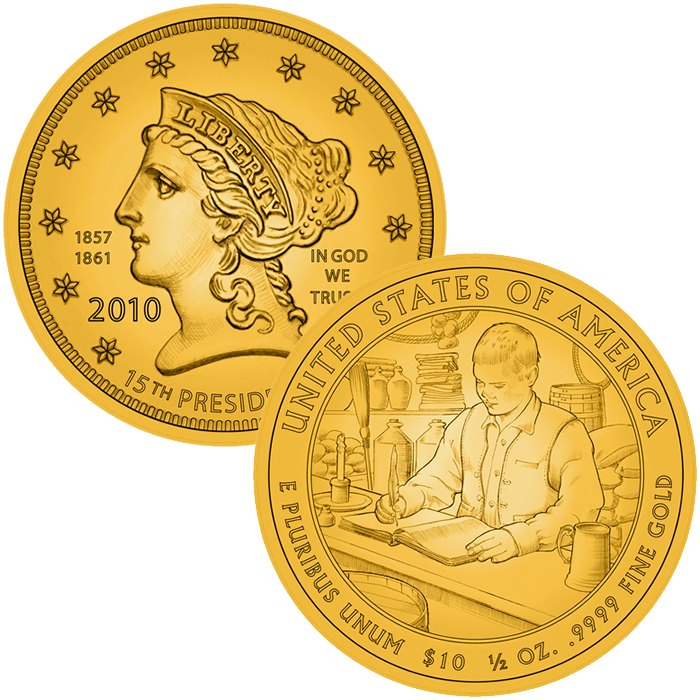 The 2010-W $10 Buchanan’s Liberty First Spouse Gold Proof Coin is the sixteenth coin in a series created to honor the spouses of the former Presidents of the United States. However, as James Buchanan served as President without a spouse, the coin honoring his tenure in office features an image of the mythical figure of Liberty. It was first seen on the Liberty Head Quarter Eagle that appeared from 1840-1907 and designed by Christian Gobrecht. Three other spouse coins showcasing a version of Liberty have been featured in the program before this one. Each coin is struck from 1/2 ounce of .9999 fine gold. As indicated by the Buchanan’s Liberty coin, if a President served without a spouse, an image of the mythical figure of Liberty will be used on the obverse of the coin. If the president had more than one spouse during his time in office (like John Tyler’s wives – Letitia and Julia), both will be featured on separate coins. Each coin features a face value of $10, but the coins intrinsic value is worth much more as each is struck from 1/2 ounce of .9999 fine gold. 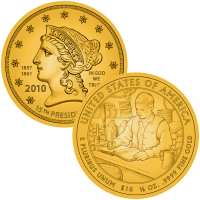 The US Mint has indicated a release of September 2010 for the Buchanan’s Liberty First Spouse Gold Coin. The issue price for First Spouse coins is dictated by the US Mint’s precious metal coin pricing matrix which ties the price of the coins to the average of the previous week’s London Fix for gold. Christian Gobrecht designed the image of Liberty found on the obverse of the coin. The reverse shows a young Buchanan working as a bookkeeper at his family small store. It was designed by David Westwood and sculpted by Joseph Menna.